Grass-fed beef is better for the for the environment, as less energy is required to grow grass than to grow grain. It's also better for consumers with less fat and more good fats (omega-3s) and better for the cow as huge stinky feedlots are horrible and inhumane. Because our farmers don't feed their animals antibiotics, hormones or other drugs, you can be sure that you are eating a natural product of the highest quality. Well, yes, but for most cows, that's only in the first months of their lives. Unfortunately, most cattle end up at huge feedlots eating a mix of grains laced with hormones and antibiotics. This process more quickly fattens the animal (hence, the fat marbling) and reduces the time to slaughter. But it also decreases the nutrition of the meat and not in a good way. Unlike beef available in grocery stores, meat from grass-fed animals contains high levels of omega-3s, fatty acids that actually reduce cholesterol and fight heart disease. This beef is a source of CLA, a type of fat with amazing cancer-fighting properties. Not all fats are bad, and these two fatty acids just might make grass-fed beef a health food. Yes, this kind of beef is more expensive, but you do get what you pay for: a better, healthier, and tastier product that supports local farmers. To reduce cost, seek out a local farmer or a CSA (community-supported agriculture) and buy in bulk. Grass-fed beef is delicious if cooked properly. This product has a clean beefy flavor but can be chewier than we are used to, and sometimes drier because it's leaner. Here are tips from Healthy Living Market to cook your grass-fed beef. Although the best steak-house steaks are dry-aged, most supermarket beef is wet-aged in a plastic vacuum-sealed bag that prevents shrinkage but also precludes the concentration of beefy flavor that occurs with water loss. What is the nutrition analysis of grass-fed beef? Eatwild.com founder Jo Robinson reports on scientific research comparing the nutrition of grass-fed and grain-fed animals. She writes: "Conventional factory meat is so cheap because they've done everything to speed growth and lower the cost of feed. ... If you eat a typical amount of beef per year," Robinson points out in Pasture Perfect, "which in the United States is about 67 pounds, switching to grass-fed beef will save you 16,642 calories (or about 5 pounds) a year." Read more about Jo's research summaries for the benefits of eating grass-fed beef here: www.eatwild.com/healthbenefits.htm. An article on the Union of Concerned Scientists' website, asks, "Will the antibiotic prescribed by your doctor be able to fight [your] infection? ... Agricultural use for growth promotion and prevention of diseases due to overcrowded CAFO (confined animal feeding operations) conditions accounts for the vast majority of the antibiotics and related drugs used in the United States." We have prepared a brochure with instructions for thawing and cooking frozen Hardwick Beef. Click here to download it. Jericho Settler's Farm (Jericho, Vermont) is one of the farms raising some of our cattle. Tips to Cook Your Grass Fed Beef from Healthy Living Market. Good Meat: The Complete Guide to Sourcing and Cooking Sustainable Meat by Deborah Krasner is available at your local bookstore. 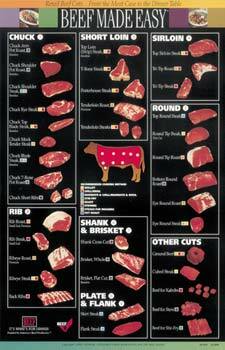 Hardwick Beef's Michael Gourlay supplied the author's cuts of beef and reviewed the text in the beef section. Burlington's Healthy Living Market has welcomed Bronwyn Dunn as a guest teacher, who features 100% grass fed beef from Hardwick Beef. In this five-part series, Bronwyn demonstrated classic recipes from Julia Child's famous book on French food Mastering the Art of French Cooking. Classes like this are held at Healthy Living Market, 222 Dorset St., Burlington, Vermont. All our meats are from locally raised cattle, thus supporting local farmers. Hardwick Beef's meat is rich in high-quality protein, natural vitamins and minerals, and it has all the health benefits of 100% grass-fed beef, including an excellent source of omega-3 fatty acids and conjugated linoleic acid (CLA) as a defense against cancer, and an omega 6:3 ratio that rivals deep water fish oils. Hardwick Beef is packaging 100% grass-fed/grass-finished beef for pets, a product created in collaboration with Dr. Susan Beal, DVM. Hardwick Beef is custom-cut weekly for your pets and is fully USDA inspected. As with all Hardwick Beef meat, there are no additives, no antibiotics, and no added hormones. The mixture we prepare for pets is ground with extra fat to meet their nutritional needs, and also contains liver, kidney and heart. As pet owners ourselves, we are making available to you the same meat on which our animals are thriving. Look for the Hardwick Beef label, which assures both quality and freshness. For direct shipments, click on the orders page, which links to our processor, to request Hardwick Beef pet food. For more information about species-appropriate diets, please contact us at info@hardwickbeef.com.